This daily correspondence between schools she attended and us gives you a glimpse of our daily life. Most parents of typical children do not communicate on daily basis with the teachers. 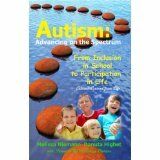 This gives a reader an insight to how important daily communication is for a child with autism. Good Morning ! S.T. was up 1st thing this AM, but she has settled down & is quiet. During a w/s – she got really confused & started humming . Before I could say a word - she blurted out – NO SINGING ! I said yes, that’s right ,but don’t yell it out Kat, just say it softly to me or yourself. She then looked around to see the other children’s reaction to her yelling out . class doing reading related w/s - she's doing her own w/s until sci/ss time. – oops – class taking sci test chp 13 today . We’ll do our own work. A very quiet morning. Assembly this AM @ 10:15 on “S.J.”. I’m sure she’ll love it! She is doing small groupmath now. They reviewed facts by doing mad minutes ( working to complete 2 worksheets quickly). Kat won ,of course! Had to prompt her to work quickly but that’s it . Tomorrow , they begin money . One thing to watch out for in writing down answers for addition/subtraction . She must always work from right to left . If you could be sure to do this at home , it would reinforce this skill for all future math . * I have a few thoughts ... will discuss this PM. Also , we will need more snack money soon . Good morning. A “drill” you can/should practice at home is passing out papers . She has been given this job quite a few times & has trouble giving each student a paper. She skips children & sometimes will act very silly & make “postures”. I will walk around with her & correct her but she should be able to do this by herself . (The music play is Tuesday, April 29th @ Middle School.) Rehearsal starts in April . Some of the girls have come up to her (individually) & have tried to converse with her & there’s been no response from Kat w/out my prompting . She’s been sitting very quietly in Music – no S.T. but no conversation either. Music today quite hectic w/ play parts given out & kids all over the room practicing lines ,etc . , but her behavior has been excellent ! ! Mixed up morning as we have 1/2 day. Music went fine. I am having to prompt Kat to respond to others . After music, kids tried to converse in hallway but no R from Kat. Kept her until she started talking (per Matt) . Back in classroom, started worksheets because the class was doing reading working ( not usually scheduled at this time) Kat started worksheets but had a crying spell (see Small Group Notes 3/4 ) . Also weepy when I asked her to push in her chair about 10 min . later. Is it that time of month again? She seems a little less with it today but she is very quiet ! No silly talk at all so far! Stayed in class for Soc. Studies as most of Mrs. R.’s class was in specials (crazy sched. again). During S.S., simply followed along reading in book for 10 min. Kat got to read and did well – everyone clapped. One bit of Silly Talk – got up to throw out a tissue (she is still weepy !) and started talking at garbagecan . Took away 1 cent Then back at seat, some faces and posturing but no talk . In SS. Kat had the opportunity to read out loud . Spoke softly but still nice . Had to physically prompt her to follow along . Tried verbal & gestured first , but no go . Didn’t know if Kat had SS. workbook(couldn’t find it, if so), so had her do a work sheet in place of. Then teacher requested that students copy the board . Asked Kat what the teacher said but she didn’t know, so gave verbal prompt to copy & she did fine . Lost track of time & unfamiliar w/ schedule , so arrived a little late to small group, sorry ! (Just realized that I should have written this is SS. section). Kat has Speech homework – pg. 52 – 53. She will get 15 bonus points if completed . Kat had some free time after small group & WS's were completed . Kat chose book corner & teacher asked Kat question, but NR. I had to prompt her. Small group is great ! Very effective. Seems to really be happy & understands much more of what's going on. It’s been awhile since I’ve gone to school w/ Kat & I see that she is fitting in more & more . Nice Day ! Hi ! In P.E. this morning silly talk offthe charts. Non-stop . Nothing effective! take away 1 cent _ crying - then more silly talk. Took her out in hallway – sat her out of P.E. Lots of crying. However, we’re back in P.E. class and much better right now! 2nd half of P.E. Better! More active participation less silly talk. Still lots of crying for no apparent reason. Back in class we’re having socialstudies. Class is reading and discussing their homework from last night. Lesson Review (Ch. 12 lesson 2) page 279 – Questions A, B, C . Having Kat pay attn. & listen. Doing a great job being quiet ! Needs somegestural prompts to attend to teacher and/or the person speaking aloud . Now we’re back in P.E. This x – much , much better! Almost no silly talk during Mrs. Baker’s instructions , rules , etc ... Great ! Again inP.E. had winter festival – snowball fight. Kat participated . Difficult for herto understand the rules. Kat had a blast ! Lots of activity – lots of fun for her. In to small group. Mrs. R. wants to work on Kat helping other students . We want her to ask questions to other students, math facts, –whatever- also wantto have Kat collect papers, etc... Can we work on this @ home ?? In small group we’re having language lesson . Kat did need prompting to raise her hand to take her turn @ the board. But she got up put her word in proper column all by herself. Needed help w/ spelling the new word . “easy”. drop the y - add i and then er or est . This is where Kat has the most opportunity to participate and this is where she seems to have more success. Really great ! Mrs. R.gave a follow up w/s. Katdid need prompting b/c hard for her to distinguish between more that 2 “ iest ” or between "2 " “ ier ” But she did at least know that it was one or the other on these choices and she started to get the idea of er and est ! See you tomorrow ! Good morning! Were having library in the classroom today (sub for librarian) . Anyway it’s just watching a fun video. Kat and whole class are silent . Excellent she’s watching - paying attn. beautifully. Class working on spelling packet. If class follows w/ test we will take spelling test or just go with the flow. Class not having spell test . Time to review S.S. HW. Kat will sit and listen for 10 – 15 minutes. Reviewing Battle of Bunker Hill and revolutionary war battles. Kat was quiet during discussion. NO v-stim! Just needed gestural prompts to attend. OFF to Music. Kat is somewhat fidgety? Can’t get her to sit still. Rewarding her for good posture not finger nail chewing etc ... helping! They’re watching a video – every thing is a video today! In music it is their unit! In small group - having math on the computer ! Fun ! Now Language Lesson on “ a ” & “an”. Kat got up and answered correctly on board. Yeah! This is a bit of a mixed up morning. Both Mrs. R and Ellen are out today so Mrs. Mitchell took K into small group class first thing as she had to cover. She was very impressed with k’s behavior despite the disrupted routine. Said “hi” and waved to sub when she entered the room! I’ve heard no silly talk at all yet this AM – we are now in health and she is paying attention to Mrs. P. beautifully. Read the notes from end of last week when talk went back up – was there anything that precipitated this? Did talk go up at home or in therapy? Trying to determine the precipitators so we can better control it. Social Studies was a film strip on Washington and Kat seemed genuinely interested (good pictures and exciting audio). Kat was attentive and began slight “talk” under her breath – warned 1 time and then removed token. It ceased. No in music with 4th grade. I am not sure this class it that beneficial to Kat. Could we discuss some other options for this time? Small group time – reviewed adjectives for a test tomorrow. Have you done this at home yet? She still needs lots of prompts to get the idea. Had to do a worksheet on adjectives today for Mrs. M. Needed prompts. Went to computer room last and chose a reading/language program to practice compound words, vowels, rhyming words and alphabetization. She did fine on 1-3 level. She is really aware of her talking now – she turns to me periodically and says, “No yappity – yappity!’ Did you teach her that one?!?! Also, would you please bring the clinic notes in the blue notebook to clinic tonight after you review them? I think I got the flu so I’m not sure if you want to come over after o work with Kat. Hi! Hope you feel better soon. No ST so far this AM. In SS class, reviewed their workbook homework and K completed worksheet while this was going on. Stopped worksheet and had her sit and listen to another homework discussion for 10 minutes. After workbook homework was finished, went on to vocabulary homework. She sat quietly but a little fidgety. Class is now working on Chapter 12 worksheet, so K will again do her own worksheet. A quiet morning and quite a bit of worksheets completed. So sorry to hear you are down with the flu! I was a little worried about you yesterday – guess my intention was right. Will call you this AM to discuss this afternoon. Kat is being a really dream today. She is quiet, happy, and actively participating in music now without any prompting. The kids are asking questions and she is answering. Had to prompt to line up again after telling her “listen for row 5”. We’ll continue to practice this. Listened to video and practiced a bit of music. She asked for a music magazine at end of class and I obtained one for her later. In the hallway, Kat was walking with a group to return to class. I was behind her – although she didn’t know it. She immediately began to silly talk and the girls were putting fingers to lips to tell her to be quiet. I stepped after witnessing several attempts tog et her to stop, and said “Ok, Kat, no music magazine’. She froze – said “No, No, No” and burst into tears. Walked her back to class as she protested, “No more silly talk!”. As we walked to Mrs. R.’s class explained to her that she needed to be quiet in the hallway and not to keep talking when someone says, “SHH”. She completely understood as I asked her later what should she do in this situation. We are now in Mrs. R.’s and she is very attentive, quiet and engaged in math money lesson. Took test on adjectives and is behaving beautifully. Good Morning - hope you are feeling better . So far in homeroom she’s been quiet . We’re off now to Art . Enclosed is the book of“ morning announcements” for her to practice . Find out the date & just plug it in & have her practice . Informed E. about morning announcements. When you feel Kat is ready , will choosea date , fill in the blanks and E. will do it with her . Notice I’ve put the assignments for social studies and science in the big blue notebook. There will be a test in social studies tomorrow. We are in SS now and are reviewing questions for the test. Kat is listening and attending quite well despite all the discussion . Gave her 5 minutes between classes to look at the music magazine . Told her why she got this reward and it really has a magic effect . She tried harder to be appropriate in her behavior and seems so pleased with herself. Hishe did not get the shammrock label at home I changed some of the data sheets I think the music catalog is making the pages fall out of this notebook is there anywhere else we can store it ? PS I enclosed the check for lunches. Hi! Hope youare feeling better! After homeroom we went to P.E. Things are fun overall! Kat is getting her hair caught in her necklace . I will put her necklace in small change purse she had in her back pack . Back in class they’re having 2 quizzes. Math quiz – had Kat do her work. Social Studies quiz. Had Kat work on coloring social studies pictures . Kids are to pick up papers in their free time and color too! In P.E. Kat is on “ Hockey Player ” team . She needsto bring in a scarf next Thurs . Each child in group has to bring in 1 thing . We weren’t sure of what things she has so we thought a scarf would be OK. If possible _ Not read or greed in color _ Any other color O.K. Hi ! Happy to hear your on your way! I do know how you feel ! I will keep an eye on " posturing " today and let you know at end of day . However keep in mind - Thursday is two periods of P.E. and this is a situation where I see it increase . Lots of activity – “ free play ” in gymnasium etc... Library is a just a movie for whole period. Danuta, can you check @ home fora Library book Kat checked out 2 wks. ago . She may or may not have one but I know if she has Library books @ home it’s only 1 Book. Due today 3-14-97 . Thank you ! Nothing in her desk@ school . Back in class they’re discussing a math topic. L x w = Area . Kat is working nicely . Verbal stim almost non-existent this morning so far . 1 minor slip I gave Kat the look and she stopped instantly ! JustgaveKat Music Magazine for reward _ her behavior so far is magnificent! Also, No S.S. or sci. this morning . Math test instead. In Music – watching more of the video. Kat is amazing ! Very quiet , paying attn. We’re off to Mrs . R.’s class . In small group aparty for D. (last day @ Hamilton ) . Took data in " playtime " section. This situation definitely increased Kat’s v. stim & posturing but able to control w/ gestures . She did well joining in w/ classmates playing games , drawing, playing on computer. Great Morning ! Hi everyone, Kat had an Ok weekend. silly talk was going up & down but seemed better than usual . Yesterday Kat went to Bridget’s harp show at the Pennsauken Library She sat quietly for over an hour during harp and poetry ! About math problems with writing: Yesterday she asked during therapy if she could go downstairs to get math work. She got her schoolbook and pulled out 4 math pages she added two numbers and then went back and cut a video title and pasted it to the math page & she kept going . Whenever sum equaled to the number of her videos she pasted the video title. For example 100 + 40 = 140 one found is the number of Bedknobs and Broomsticks on our home video collection . we noticed this morning that Melissa wrote no writing words on the math sheets she was writing the titles. So I guess she figured pasting was ok. I say whatever make her enjoy math lether do it for now . What you think? Good morning so far . Finished music , no talk , listened well to other kids andtried to respond to them . Interesting – whenever a TV or computer screen is in The room , Kat tries to sneak in a little posing on the way by! Shetries to be so nonchalant about it - I have to laugh to myself - she knows she’s not supposed to do it ! Right now in math ( Mrs. R. instructing ) Did one quick worksheet and then went to money games set up around The room . Kat maintaining good EC. towards teacher . Because there are so many stations ( each w/ a different game) I am going with her to instruct , notshadow . She caught on to most games quickly . Language , still doing adjectives . Describing words i n sentences – having to help w/ direct instruction. She has trouble w/ knowing what is a describing word and what i s a noun . Hi ! Quiet this morning – so far. Hope you are practicing announcements @ home. Please send in announc. packet & I’ll "test” her out to make sure she’s ready . Also – please start her practicing the pledge . She will alternately shout & then whisper the words that she knows . Almost constant nail biting while listening to science thisAM ( p . 262 - 263 ) Do you notice the pages of this book are tearing & ripping ? I remove the music mag . when I write , but it seems it’s still very full . Maybe you can cut the data sheets in 1/2 to make them "thinner " or shrink the prompt scale & paste it to the opposite page. Oh well , these are only suggestions . She sat quietly during sci . disc. so I let her look at mag for a few minutes . Boy – did her face light up ! ! About math problems with writing, yesterday she asked during therapy is she could go downstairs to her math work. She got her school book and pulled out 4 math pages she added two numbers and then went back and but a video title and pasted it to the math page and she kept going. Whenever sum equaled to the number of her videos, she pasted the video title. For example, 100 + 40 = 140, one - fourty is the number of bed nobs and broomsticks or our home video collection. We noticed this morning that Melissa wrote no writing words on the math sheets she was writing the titles. So I guess she figured pasting was ok. I say whatever makes her enjoy math let her do it for now. What do you think? This is incredible! I thought she was stimming on her videos by writing in the titles! This girl really has a tremendous mathematical mind. My feeling is, let her continue to do all of this at home, however at school, someone else could be confused by this or see it as bizarre so not at school. (since she does math worksheets similar in Mrs. R.’s room). Finished up in art – observed Kat from a distance to see if she would take directions from Mrs .De. and other children at her table . Mrs. De. repeated directions 2X for Kat and she finally tuned in to her . Spoke to her after class and asked if she would continue to give her name directly so she would listen to her more . We are now in science . Kat losing attention after 5 min. Mrs . De. is demonstrating w/ her hands what an earthquake is like . She asked class to do it as well . Kat is resisting and I am insisting ! She is starting to fuss but I have noticed a big difference when you don’t allow her to zone out – she may whisper a bit but it is over soon and she is back withit , better than before . She is now following beautifully in book – this skill has really improved . Emphasizes in this unit the 3 theories of plate tectonic movements . ( pg 271 in Text ) She has copied the definitionfrom The book with the rest of the class . Doing a nice job . Art appreciation – filmstrip on Rousseau w/ entire 5th grade . Kat was fine . Last this morning , Mrs. R. read from Helen Keller . Only 4 kids in class today so one wanted to sit on the floor to listen . Asked Kat if she wanted to - (she looked like she did) so she sat onfloor , too . All the kids joined in and started to giggle . It was great to see her gigglealong with the group – really cute! I put extra paper in the front hopefully this will help the pages from falling . Could Kat go on thursday and observe another child do the announcement Thursday ? Good morning ! S . T down - In Art , we had to plaster our creatures & Kat would not touch it . I did it w/ her at 1st , but she said NO - "I want to wash my hands.” I let her go – no reason to force her to do it . She didn’t like the feel of the plaster on her hands . Hope you like my creation ! ! I’ll practice announcements w/ her today & we’ll go & watch tomorrow AM. 3/20 Hi the Black scarf is in her bag . She has the announcement memorized so I need it more now then Kat . Hi! Good morning . When I arrived@ school Kat & Mrs L. observing announcements in main office. Got settled – went back down to office and had Kat practice doing the announcements. Unfortunately I am not able to be here tomorrow. I will miss the big day. Melissa will be covering for me tomorrow 3-21. I have a funeral to go to. Thank you again Melissa! Well, it has been an active morning. Winter festival in P.E. w/ both 5th grade classes. Lots of fun . Kat did a wonderful job ! Scarf was a big hit ! Thank you! Back in class students are working independently on math worksheets ! Perfect! Kat doing math worksheets as well . Nice blend ! Now in science watching a video – having a discussion on plate techtonics. Kat is watching – listening to teacher. Overall – Kat is doing a terrific job being quiet – no verbal stim . Today she is chewing her nails non-stop. I think this is definitely something that is replacing extraneoustalking . Better with some prompting but still needs reminding . Now in Mrs . R.’s class Kat playing a math game . Topic - skill is money – she's very accurate with her amounts but Mrs. R. needs to remind her to attend . Not always paying attn. and needs prompting from teacher when it’s her turn . Really good activity for her though ! Lang . Read Helen Keller story_ Asked Kat various ?s. Some "who" ? from Melissa’s sheet . Continue to work on this ! Offto lunch. See you later ! Hi, Good luck with the announcement today. Kat went to Wizard of Oz play at the Middle School last night . OH MY GOD – SHE WAS FANTASTIC ! ! She spoke so clearly & slowly, w/ great intonation & perfect volume . We all cried ! When we returned to the classroom , the children stood up & cheered& clapped for her for at least 2 minutes straight ! ! It was wonderful ! ! Have a great weekend ! ! Kat had a banner morning so far! I’ve been inundated with comments on how well Kat did with the morning announcements. What a wonderful experience – she is still glowing. I am so proud of her as I know how anxious she was when she first started to practice. Another great achievement for Katherine. We left library (She was there alone with kids but no problems – not even talk) and returned to class for science. The class is alternately reading from the book and listening to Mrs. D. lecture on volcanoes. There is an assignment for the class to draw the 3 plate movements of volcanoes. Do you think she should try it> she has attended for about 20 minutes now! We are going to take a break ( for the bathroom) and then come back in for another 10 minutes. After 10 minutes had a fire drill – perfect break again. We were outside for 5 minutes (kids talked to Kat) then came back and completed a worksheet with the class. This may help when test comes around. Finished 45 minutes of science with 2 long breaks! Great! Kat has said to me twice this morning “I want to go to school. I feel happy”. These comments did not seem to be a prompt for one cent or anything else – she seems genuinely happy and just wanted to tell someone. She went on to say what she was going to have for lunch and then play at recess. This is really wonderful to see. Hi, good luck with the announcement today. Kat went to the Wizard of Oz play at the Middle School last night. Also - revised data sheets - should be easier - let me know if you have any questions! I would like to try a simple spelling test w/ Kat each Friday . Next week is too short , but let’s begin after vacation . On Thurs . , between (12:10 – 12:30) have her do some of the lesson 20 activities ( words ending / beginning with " sh " ). There are 12 of them . Have her review on Friday and Then ask her to take a test to see if she retains them . A lot of these lessons have words w/ endings and beginnings she needs to practice . Let me know how it goes – thanks . Hi! Couldn’t find the book this AM so I assume you are working on it still. Will try to call you today but just found out there is a guest speaker on Wednesday afternoon. Maybe this would be a good day for me to stay at school with Kat all day? Art will also be in the afternoon on that day. I will talk it over with Tom this afternoon – I am scheduled until 2:30 that day but would be happy to stay a little longer so Kat could try a full day at school. Kat was quiet as a mouse in health today. She is self-prompting a lot (saying “no silly talk, no singing, etc.) so we have to remind her not to say it too much. If she continues we’ll have to extinguish but we’re not at that point yet. Went to cafeteria to have her picture take with her troop for Girl Scouts. (yearbook, I think). Off to music and really ad fun doing the bunny hop with the group. At the end of music, the kids played silent call. Kat has really caught on to this game and plays very well now. In Mrs. R.’s room, Kat finished her math and listened to Mrs. R.'s lesson on money. The only thing that holds her back is that she cannot yet regroup. (borrow in old school language!) She counts very well and is a star when it comes to accurately completing her math. 3/26 Tomorrow at 3:30, Michelle will be here . Also , could we have more math worksheets , please? Thanks! Good morning ! Quiet this AM . children reviewing math problems so Kat did some math w/s. Class is working on greatest & least in ordering fractions . She self – prompted “ NO S.T., no posing , no singing ” 3x this AM . I spoke to her about this & she stopped but then continued but covered her mouth w/ her hand ! ! Then she looked at me& said , " Hi Mrs. L."! Kat is still working on worksheets as the class is still doing math. This is not usually what they do at this time ( social studies or science ) but we are just going with the flow . As for tomorrow , we will be staying in school allday. I will bring Kat home between 3:00 and 3:15 as that is what time school ends . Instead of telling her she is staying , I would like to use it as a reinforcer for good behavior /work etc. tomorrow AM. So I will tell her sometime tomorrow morning that sheis staying at school. Hope we have her usual good behavior – I’m sure we will! Hi ! Our visitors are now here in S.S. Kat is sitting quietly & listening to people who wore clothing from the 1800’s . Kat is listening well now and with only a few prompts had made itthrougha long presentation . Thespeaker is a high school history teacher , Mr. B. , and he has 2 highschool students dressed in period costumes as well . One of them is Mrs. D.’s son. Kat has examined all the interesting items he brought with him but she put her fingers in her ears when she saw the musket . Guess she figured it might go off ! In Mrs. R.’s class,sincemostof the other childrenare in the reading assembly which Kat will havethis afternoon , we are doing worksheets . Thanks for including more math sheets . She loves them and is doing so well . Lunch was not followed byrecess today. We wentto a reading assembly in the cafeteria. All the kids were excited but Kat did quite well despite the noise and confusion. She kept saying “ Iwant to go to party ” . ! I told her “ assembly first , party later ”. She said “ OK! " Now weare back in the classroom for a party. Kat is so happy that she can hardly contain herself . Hope she doesn’t think school is like this every afternoonor I’ll never get her back home after recess after vacation ! Hi ! Good morning . OFFto P.E . Kat doing a nice job w/ participation today. Except for some skills practice ( playing hockey ) she really doesn’t need me right now. Getting very ind. in P . E . Back in RM. sciencegame to prep for test . Gave Kat her test and class test as well . I wrote the correct answers to class test so you can compare . Difficult for her but she did get some Responses correct ! She carried the Knowledge over from her test ! Great . We did not go to P . E . b/c of test . Now to Mrs . R.’s room. Kat working on 'Money' w/ Mrs. M.
Hi could you give Kat her test when science test is going on . Can you also try to give her the test the class is taking as a baseline ( She might say things outloud so it might not work). Kat isstarting to rearrange our house she first triedto move the TV ( 3 times ) to her workroom . Now she is trying to move my copier from my office to her workroom ! Please let Mrs Ro. know that Kat cut out picture from the Black Hole ( she did not color ! ) I will pay for the book or replace with a book they need for the library I repaired it but I will pay for the damages . Next rule no coloring No cutting library books ! We’ll talk with M. on strategy to stop her from damaging books.